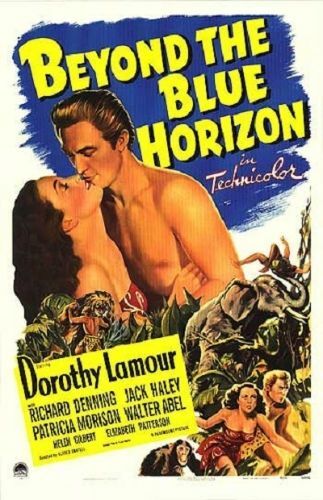 It's Dorothy Lamour again, sarong and all, in the South Seas wish-dream Beyond the Blue Horizon. Lamour plays Tama, a daughter of the jungle who heads to the US to claim an inheritance. For publicity purposes, press agent Squidge (Jack Haley) tries to team Tama with his client, circus lion tamer Jakra (Richard Denning). As it turns out, Jakra is compelled to return to the South Seas with Tama to obtain positive proof that she is indeed sole heir to her family's fortune. The climax finds Jakra putting his animal-taming skills to practical use when a rogue elephant goes on a rampage. One suspects that audiences in 1942 didn't believe this one either.